Centred on the Polaris World development, the Nicklaus Golf Trail is the world's most concentrated collection of golf courses designed by the Golden Bear. 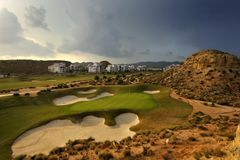 Blessed with the famous sunshine that washes over Murcia and its outstanding golfing destinations, which include La Manga, the Nicklaus Golf Trail offers fantastic courses and equally impressive value for money. To plan your perfect tour speak to our dedicated Murcia specialists.